I took this photograph of Aspens in Flagstaff, Arizona near the San Francisco Peaks. The aspens are all native to cold regions with cool summers, in the north of the Northern Hemisphere, extending south at high-altitude areas such as mountains or high plains. They are all medium-sized deciduous trees reaching 15–30 m (49–98 ft) tall. In North America, it is referred to as Quaking Aspen or Trembling Aspen because the leaves "quake" or tremble in the wind. This is due to their flattened petioles which reduces aerodynamic drag on the trunk and branches. Aspens typically grow in environments that are otherwise dominated by coniferous tree species, and which are often lacking other large deciduous tree species. 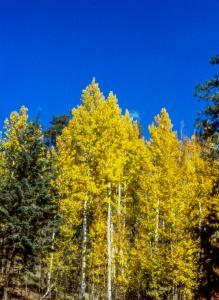 Aspens have evolved several adaptations that aid their survival in such environments. One is the flattened leaf petiole, which reduces aerodynamic drag during high winds and decreases the likelihood of trunk or branch damage. Dropping leaves in the winter (like most but not all other deciduous plants) also helps to prevent damage from heavy winter snow. Additionally, the bark is photosynthetic, meaning that growth is still possible after the leaves have been dropped. The bark also contains lenticels that serve as pores for gas exchange (similar to the stomata on leaves). Aspens are medium-sized deciduous trees, commonly 20 to 80 feet in height, and 3 to 18 inches diameter. Trees more than 80 feet tall and larger than 24 inches diameter are occasionally found. Their bark is smooth, greenish-white, yellowish-white, yellowish-gray, or gray to almost white in color. The green color is from chlorophyll in the bark. Their bark may become rough and fissured with age. Aspen leaves are thin, firm, and nearly round, 1 1/2 to 3 inches diameter. They are pointed at the apex and rounded at the base, with many small rounded to sharply pointed teeth along their margins. Aspen leaves are smooth, bright green to yellowish-green, dull underneath, until they turn brilliant yellow, gold, orange, or slightly red in the fall. The leave's small stem (petiole) is flattened along its entire length, perpendicular to the leaf blade. The flattened stem allow the leaves to quake or tremble in the slightest breeze; hence, their name. The leaves of young sucker aspens may be much larger, sometimes 7 to 8 inches long. Aspen trees usually do not live more than 150 years, though they may persist more than 200 years. It grows on many soil types, especially sandy and gravelly slopes, and is quick to pioneer disturbed sites where there is bare soil. It grows best where soils are moist and sunshine is plentiful. Aspen is intolerant of shade, and does not compete well with more shade-tolerant conifer species. The green-winged teal (Anas carolinensis or Anas crecca carolinensis) is a common and widespread duck that breeds in the northern areas of North America except on the Aleutian Islands. This dabbling duck is strongly migratory and winters far south of its breeding range. The natty male has a cinnamon-colored head with a gleaming green crescent that extends from the eye to the back of the head. In flight, both sexes flash deep-green wing patches (specula). It is highly gregarious outside of the breeding season and will form large flocks. In flight, the fast, twisting flocks resemble waders. 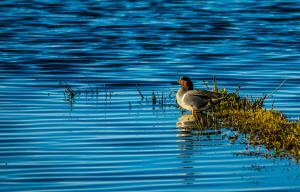 It is a common duck of sheltered wetlands, such as taiga bogs, and usually feeds by dabbling for plant food or grazing. It nests on the ground, near water and under cover. Look for them on shallow ponds and in flooded fields, and listen for the male’s decidedly non-ducklike whistle. These common ducks breed along northern rivers; wintering flocks can number as many as 50,000. A good time to look for Green-winged Teal across most of the continent is during spring and fall migration, when the birds land in shallow wetlands, sometimes foraging in little more than puddles in flooded agricultural fields. It winters in the southern states and along both the Pacific and Atlantic coasts. The green-winged teal is an early migrant. They migrate in large flocks and often fly low over water, wheeling and turning together. Males migrate first. Green-winged teals migrate both during the day and at night. Coast live oak occurs in the coast ranges from north central California southward to northern Baja California. A picturesque, broad-canopied, evergreen oak, 20-50 ft. high and wide. Old trees can reach 100 ft. Thick, slightly glossy, gray-green leaves are oval and holly-like. Evergreen tree with short, stout trunk; many large, crooked, spreading branches; and broad, rounded crown; sometimes shrubby. This is the common oak of the California coast and foothills, forming parklike groves that often appear in the scenery of motion pictures made in Hollywood. The lower limbs of ungrazed trees often recline on the ground. Mature bark is gray and shallowly furrowed. Leaves are oblong to oval, 2 to 6 cm in length, cupped, with entire to toothed margins. The upper surface is strongly convex, deep green and smooth, but the lower surface is paler, with hairy-tufted vein axils. 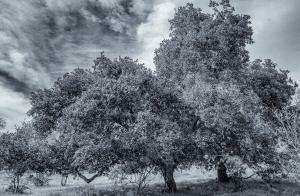 Like all oaks, coast live oak is monoecious and wind pollinated. Acorn cups are composed of thin, flat scales. The one-seeded nuts are 2 to 4 cm long, narrowly conical, and mature in one year. On average, trees have high acorn production once every 2 to 3 years. Flowering takes place from February to April. Fruits mature between August and October. Coast live oak is the only California native oak that actually thrives in the coastal environment, although it is rare on the immediate shore; it enjoys the mild winter and summer climate afforded by ocean proximity, and it is somewhat tolerant of aerosol-borne sea salt. The coastal fog supplies relief from the rainless California summer heat. It is the dominant overstory plant of the coast live oak woodland habitat, often joined by California bay laurel and California buckeye north of Big Sur. Associated understory plants include toyon, various manzanitas and western poison-oak. Normally the tree is found on well drained soils of coastal hills and plains, often near year round or perennial streams. It may be found in several natural communities including coast live oak woodland, Engelmann oak woodland, valley oak woodland and both northern and southern mixed evergreen forests. While normally found within 100 kilometers (62 miles) of the Pacific Ocean at elevations less than 700 meters (2,300 feet), in southern California it occasionally occurs at up to 1,500 meters (4,900 feet) in altitude. The California oak moth (Phryganidia californica) caterpillar subsists entirely on living and fallen leaves of the Coast Live Oak. In 8-10 year cycles, the caterpillar will appear in sufficient abundance to denude healthy trees. The trees recover, and botanists speculate that the species provide mutual benefit, possibly in the form of fertilizer for the oak. The coast live oak is also the only known foodplant of Chionodes vanduzeei caterpillars.